The thing is, Factorio has actually been out in beta form for some time now, but only recently arrived onto Steam’s Early Access platform. As such the game’s popularity has increased greatly in recent weeks. One of my favourite YouTubers, Arumba, addressed this by starting a new video series, but he has an old one on his channel from when the game was originally made available. As I alluded to in the opening paragraph, there is plenty to do in Factorio that is keeping Let’s Players and Twitch Streamers busy. 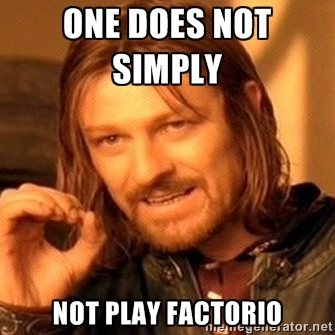 So the question is, what is Factorio? The best description I can give is a game that is somewhere in between Command & Conquer and any base building sim type game. You play the game as a character stranded on an alien planet after their spaceship crashed and are assumed to be the only survivor. Fortunately you are an engineer and have the know how to start planning your own escape from the planet, provided you use some of its resources. Iron, Copper and Stone can all be mined, by hand at first before you then build mining equipment that can automate the process. 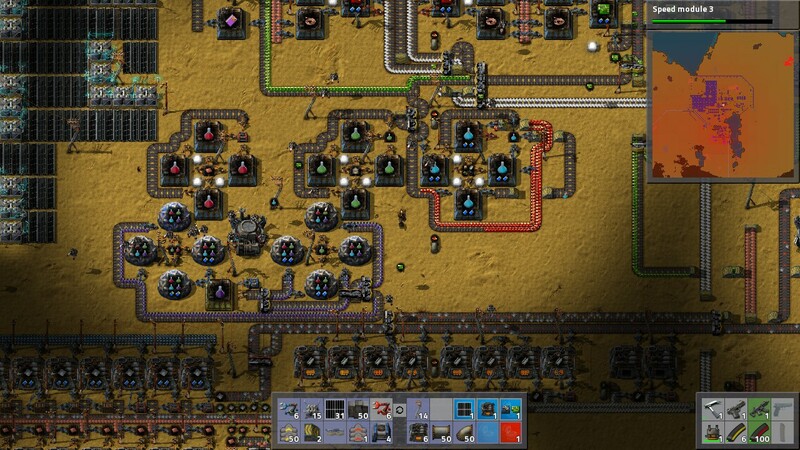 And thus is the meat and bones of Factorio. Everything you can build in Factorio requires components. Some of these will be raw material, but more often you will need to smelt and combine ingredients into other components. 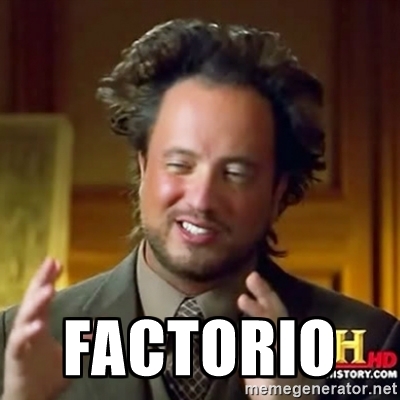 Factorio contains a massive tech tree that unlocks new things to build, but also better ways to build them. Even the technology needs to be researched in a lab, using different science packs that must be crafted. Fortunately you don’t need to do this by hand. Once you have assembly machines available then you need to start planning how best to create an automated layout. 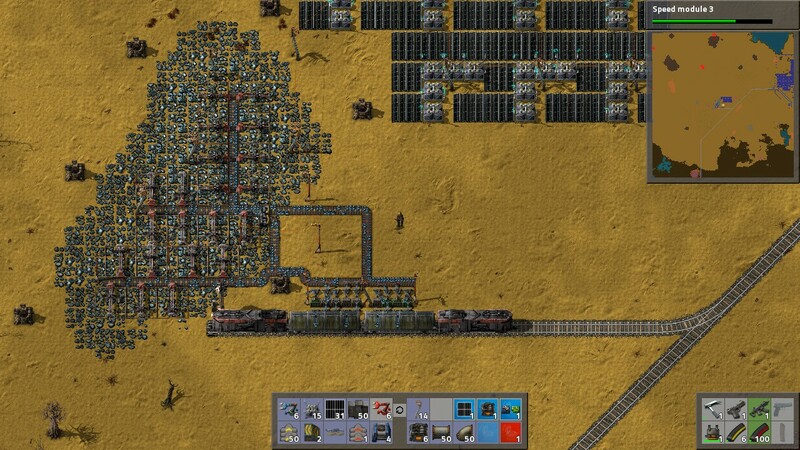 Using inserters and transport belts you get your ingredients to the assembly machines, and their products out and onto the next place they are needed. Before you know it you will be chaining up your factories to make complex components such as advanced circuits and electric engines. There will only be so much networking of transport belt you can do before it comes unwieldy. And there will only be so much mining of resources possible from your starting location. 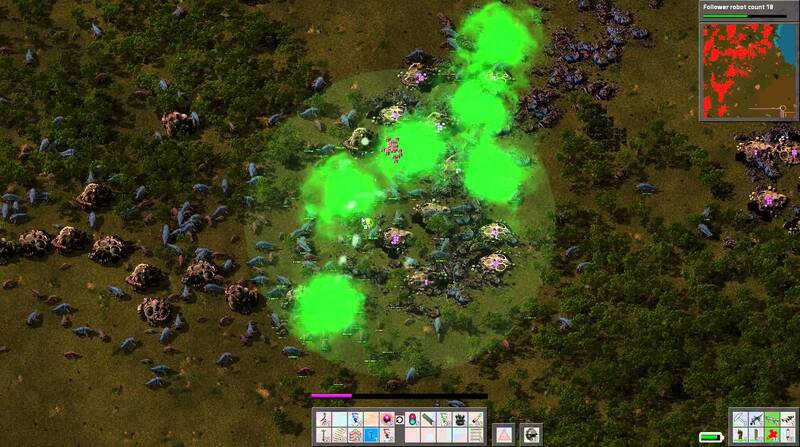 Before long you will be looking to expand your base and increase your resource mining income. To do that you will need to scout the map for the larger mining deposits and set up a remote mine. 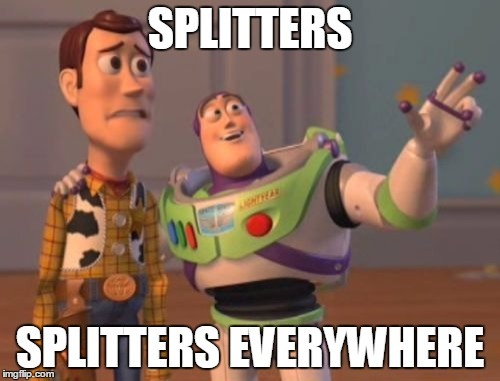 Once you have that, you need to get the resources from the mines to the factories. 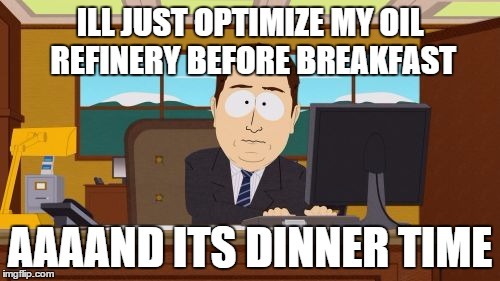 This is about when you should have researched trains, and the game moves to a whole new level of planning. If you watch any Twitch streamer playing Factorio in a later stage, you will likely see them building a large network of trains running between multiple mines and can be a little daunting, but if you like your simulation games you will know exactly the depths that simulation games go to. Fortunately there is also a solution to the micro management of resources too. In the tech tree there are two types of drones that you can unlock, building drones and transport drones. The later can move resources between certain types of storage chests, mainly the provider and requester chests. You can set these up in a way that get your resources moving from where they arrive by train to the specific factory or belt line that they need to be on. They will also bring resources directly to you from storage if you request them to your inventory. Building drones will automate the completion of any blueprints you lay. To create a blueprint you will first have to layout a system that you want copied, for example; part of a solar farm. Then you can simply lay down the blueprint where you want to build and the construction drones will do the rest, provided the components are available. As if all this building, planning and logistics wasn’t enough to deal with, you need to be concerned about your health and safety while planning your escape. Why? Because you aren’t alone on this planet. A critter like species already lives here, and they’re not going to take kindly to all the pollution you are going to create with your factories. Unless you play in passive mode, in which case the aliens won’t attack you unless provoked, then they will start to raid your bases when you create too much pollution or get too close to their hives. This is where the Command and Conquer element of the game comes in. There are a host of military technologies to unlock and build. Walls can be build around your bases and turrets erected to fight back any alien assaults. You’ll need a gun yourself and for later, when you start to explore, you can build yourself a tank to go running around in. Killing an alien hive will yield some of their vital alien technology orbs, so even if you are playing in passive mode you will need to go hunting at some stage, as you’ll need these for unlocking the top level science packs for the research labs, and naturally you need these science packs to research the top tiers, such as rocketry, before you can think about completing the game. Completing the game is not something I’ve done. Over the time of writing this preview I have spent another 20 hours playing Factorio, building my factories, going on Alien raids, laying new railroads. But escaping the planet I am no closer to doing. But you know what? I’m pretty happy to stay here for a lot longer and to just continue building away. If you have any addictive tendency at all when it comes to simulation and base building games, then you will fall in love with, and get lost in, Factorio.